Today was the official start of our 8-week Board Game Challenge! Who else wants in? I have some friends participating over on our Facebook page. Comment there or here and let us know what games you’ve been enjoying. Bonus points for photos and game ratings! So, I’m not sure the best way to record this challenge. I’m thinking I’ll post the date, a photo, and links when applicable and add to this post daily. How’s that sound? T, Leo, and I played Quirkle while Seuss was catching up on sleep. 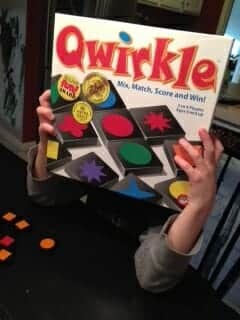 Quirkle is an old standby in our house. It is easy to learn and fun for all ages. Quirkle comes with a draw string travel bag, so we always take it on vacation. Quirkle always reminds me of Scrabble. Similar strategy and point system. We, however, usually play without scoring because it’s easier for the littlest two poppies. It is a whopping 12 degrees outside, it’s windy, and our yard is filled with construction supplies and workers. We opted for two games today, folks! We’re living crazy over here. I love this version because the sight words on the yellow playing pieces are plain, no frills, but they jazz it up on the card. So while your card gives you a clue as to the word meaning, you have to actually recognize it here. 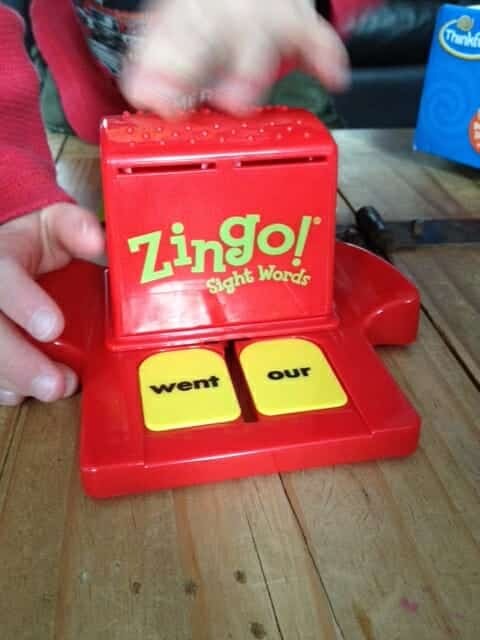 Sight Word Zingo! 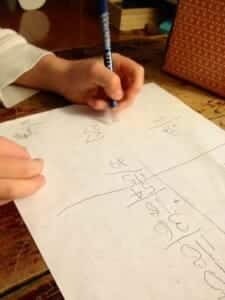 is a twist on the classic version, with 72 of the most common sight words in lieu of the standard words/images. If you aren’t familiar with the original Zingo!, it’s essentially a modern Bingo that sneaks in vocabulary development. Genius! Our sweet T is an early reader and so this game is absolutely perfect for her. Typically, Seuss plays with us as well and he’s already recognizing some words as a result. Today, however, he opted to snooze which is just fine with us because he was crabby today! The first player to get three across in any direction wins, however in our house the first person to fill the entire card wins. That’s because we like to shout, “Zingo!” over and over again. Our friend, Santa Kate, gave us this game and a couple of packs of Tell Me a Story Cards for Christmas and we have played it every couple of days since then. 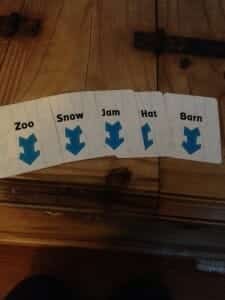 Are you guys familiar with the Tell Me a Story cards? This game is from that amazing company. 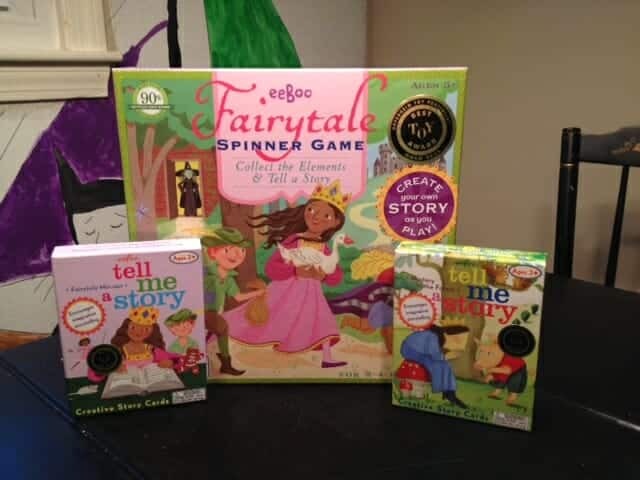 The Fairytale Spinner Game’s illustrations are gorgeous, just like the Tell Me a Story cards. 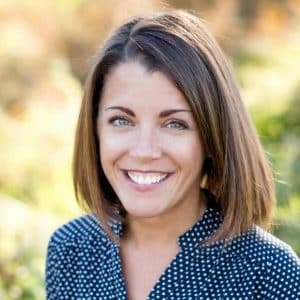 Can we get a shout-out for Santa Kate, folks? How perfectly awesome is this gift for our little family?? T was our winner this afternoon and I tried to record her adorable winning story but, alas, my phone [which recently fell in the john] was not up to the task! 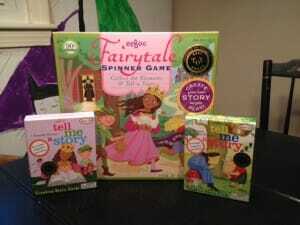 This is a wonderful family game that encourages imagination, story-telling, sequencing, and fun. 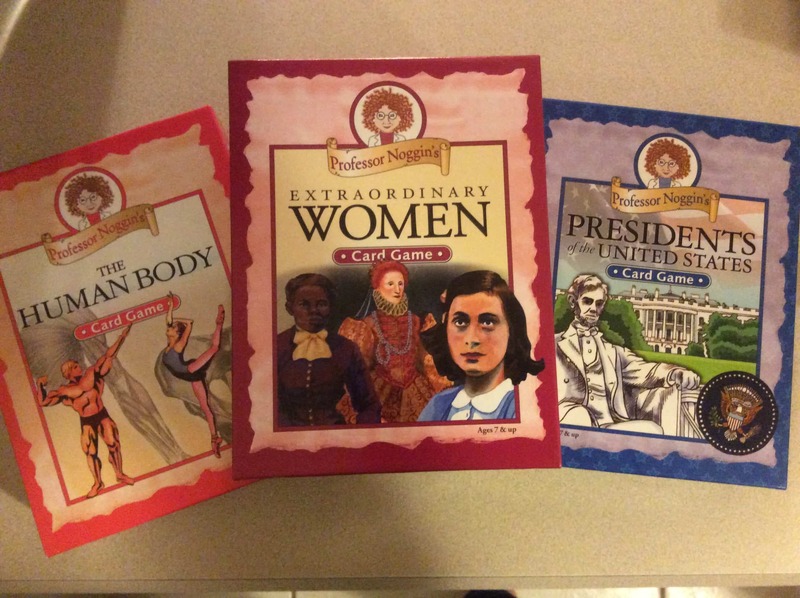 It’s a perfect board game for book lovers! I love when Seuss wins the game because he usually morphs into an imaginary creature and then uses the remaining characters as puppets and puts on a show for the entire family! Today was a lousy day. In fact, it was our worst day of homeschooling to date. Thankfully, some game playing in the afternoon made up for the fact that the morning was miserable. Because we accomplished very little in the way of homeschooling earlier in the day, I strategically picked two math-related games and we ended up having a blast. Little did Leo know that he did, in fact, do math today. Doesn’t it just look fun?? So colorful. 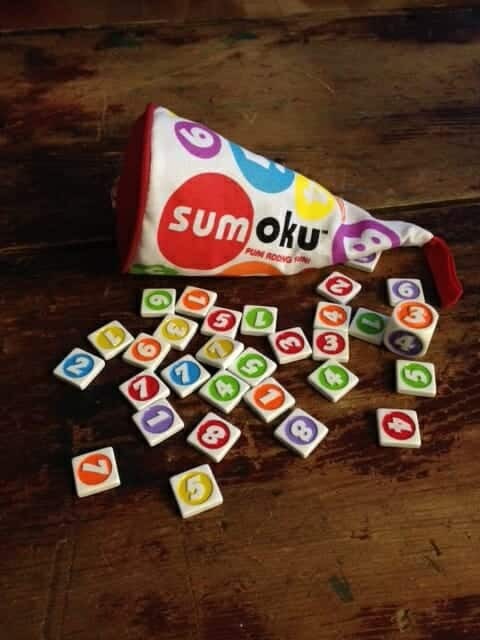 Sumoku is like a mathy Bananagrams, folks. It is a crossword-style math game. For each game, you roll a die and the number that you roll (either a 3, 4, or 5) is the “key number” for the game. Players take turns placing single rows, in a crossword-style, of tiles that add up to a multiple of that key number. The player with the most points at the end of the game is the winner. Again, much like Bananagrams, Sumoku comes in a playful little pouch that travels easily. And he thinks he didn’t do math today! We received this game as a gift from my awesome homeschoolin’ mentor. The version we have is made for two players, however, they have since updated the game for 2-4 players. For Countdown, players take turns rolling the dice and then convert the two numbers rolled into one number using either addition, subtraction, multiplication, or division. The goal is to flip up each of the ten keys (representing the numbers 1-10) on your side of the board. The first player to flip up all of his or her keys wins the game. This game been updated so that up to four people can play! When we first started playing this game over the summer, we would use addition and subtraction only but as Leo improved his math skills, we added multiplication and division. Simon: Who could forget this old classic? Leo loves it as much as I did as a kid! Today, I lost the game vote so I will be the first to tell you that these two games are not my favorites. I, admittedly, have some sensory sensitivities of my own and any toys that make noise drive me crazy. I can’t tolerate it for long but we are under a cold snap here and when it’s in the single digits and your kids are climbing the walls and want to play a game that requires some physical movement? You just go with it, folks. Bop It can be played solo, with a partner, or even as a party game. Basically, it’s an electronic Simon-says. The game gives you orders and you have to follow them correctly and quickly and it gets more challenging as you get better at it. My kids think this game is hysterical and it is very goofy to watch them play. Personally, I would rather play a board game but I lost the vote today. This is another electronic game that tests your speed and reflexes. 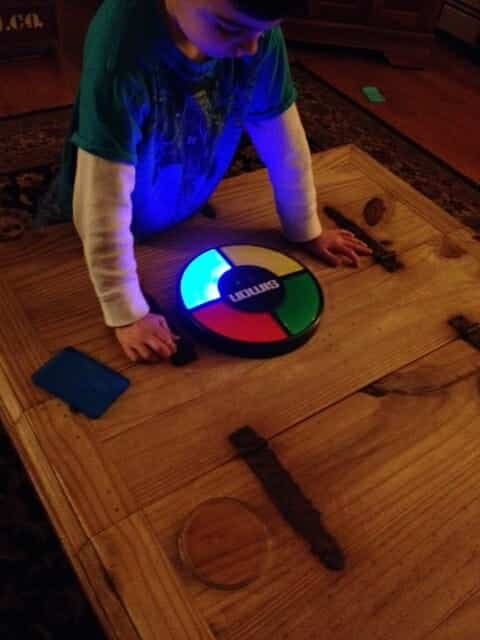 Basically, Wobble Deck is a balance board that gives you commands to follow (“Red! Yellow!”). It’s also sort of a Simon-says. Today, we played an old classic: Operation! Folks, I am headed out to a MNO with my village so I have to be quick. I will expand upon this later, but today we played an amazing and gorgeous game that my brother and sister-in-law gave us for Christmas. 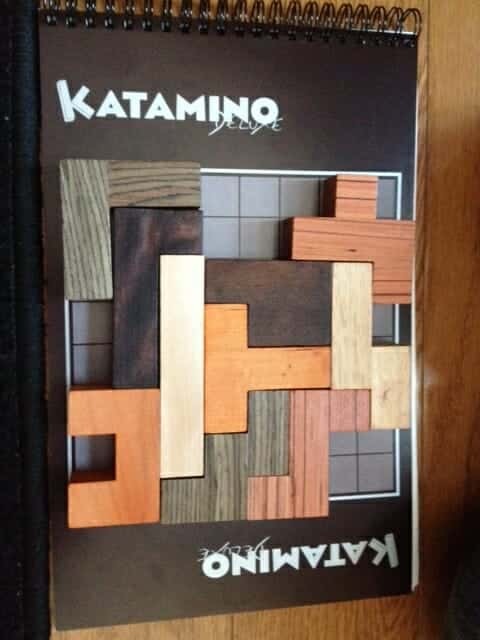 The game is called Katamino. It has won a number of awards, it can be played solo or with a friend, and there are many different levels so you can continue to be challenged by the game as you grow. Plus, the game is striking. You want to leave it out on your coffee table. I would, except I’m afraid we’d lose pieces. This afternoon, Schizz and I played Pairsinpears with our youngest two poppies (5 & 3 years of age). 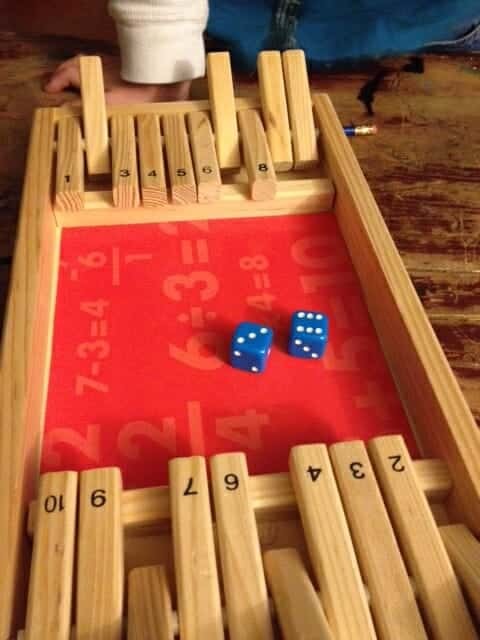 We modify this game for littles. 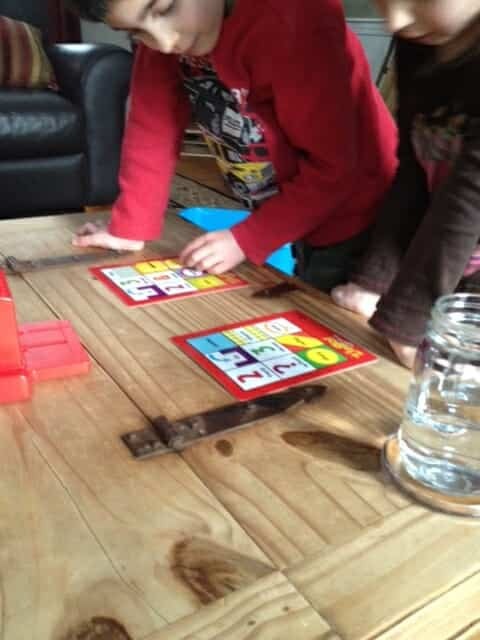 We pick up random tiles and say the letter, the sound, and a word that begins with the letter. Then, we discard the letter tiles into a pile and if we get a double, we match letters. Sometimes we use them to spell words. There are several versions of this game that you can play as the kids age. Like Bananagrams, it travels easily and can be played virtually anywhere. Folks, I love this version of Memory. I had an old Memory game that I had picked up for a dollar years ago. It’s now battered, bent, and missing cards. This year, Santa replaced it with this version. The illustrations are absolutely beautiful, the colors incredible. The cards themselves are talking points, folks. Highly recommend! 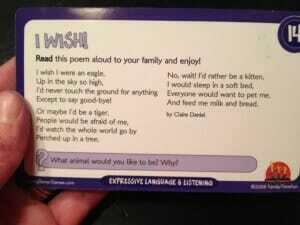 The kids love this game, especially my little Seuss who played it with me today. Folks, can you even believe I have another sick kid? I’ve got a sad little Seuss, so we were not able to play as long or as many games as we would like this afternoon. I did participate in one game of No Stress Chess with Leo and then Leo and T played together. Here’s Leo’s post on No Stress Chess. I’ll let him review it for you guys tonight because I’m off to a meeting. Hope this post finds you all much healthier than we are! 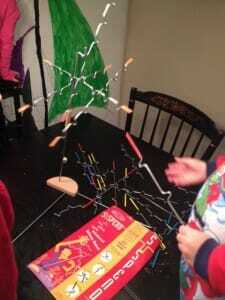 Suspend by Melissa & Doug (1 – 4 players, recommended ages 8 and up). I mentioned this game the other day in my One-Player Games That Kids Love post. We received this game for Christmas and it has been used many times since. This is one of those games that doesn’t take up a ton of space, offers a challenge, and is versatile in that you can play by yourself or with friends. Terrible photo because everything was moving! Are you ever looking to spark some conversation at dinner, or to make family dinner more fun? Look no further! We keep this handy little game on top of our fridge so that we can easily grab it when the mood strikes. The game cards are laminated, so if you have someone who spills his beverage at every meal like we do, you don’t risk game damage. 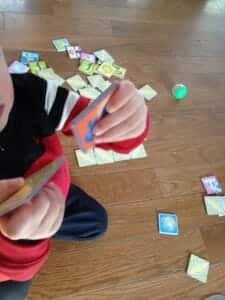 The game cards cover several categories: just for fun, the five senses, creative and critical thinking, memory, expressive language and listening, and social skills. 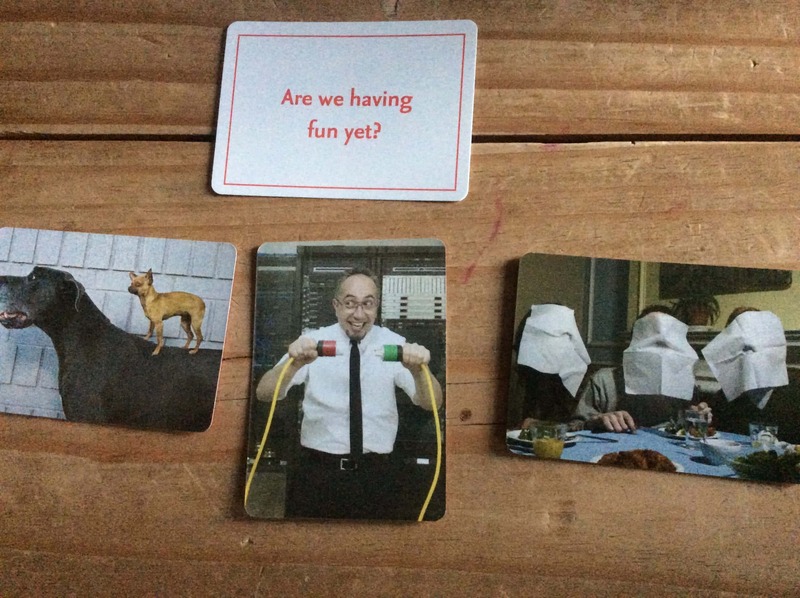 Each card has an idea for an activity or a game that you can play at the dinner table. This game never fails to make us giggle. Tonight, one of our cards asked one person to make a sound effect and see if anyone else could guess it. Leo made the following: a blue whale call, the lowest note on his keyboard, and the sound of sleep. We weren’t able to guess any of those noises, but we did laugh quite a bit! 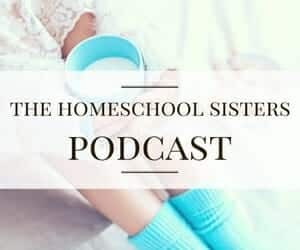 The answers were classic: Leo wanted to be a dolphin so he could do tricks, T wanted to be a cat so that she could snuggle, and Seuss wanted to be a lion so he could roar. 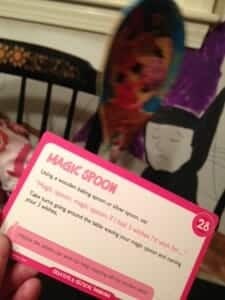 For this one, we used our beloved Talking Spoon! And if you guys like this idea of this game and you’re looking for others, I have that info for you, too! We absolutely love Table Topics. Table Topics cards are similar to Beginner Dinner Games in size, but they focus on conversation starters instead. We have a couple sets but the family version is our favorite. Zimbbos! 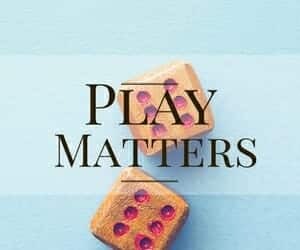 (1-3 players, ages 3 and up) So the other day, while waiting outside in the freezing cold for Kindergarten registration, I realized how badly I need a night out. And so tonight, I’m headed out for a much-needed MNO following a stretch of illness and a triple dental appointment. 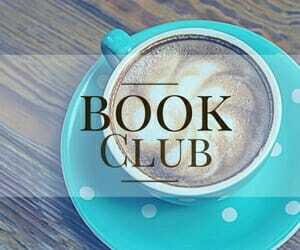 Therefore, I’m going to make this one short and sweet and tell you that Zimmbos! is awesome because all of your kids can play it without need for modification. Seuss loves feeling like a big kid! We had a blast playing this before dinner tonight! 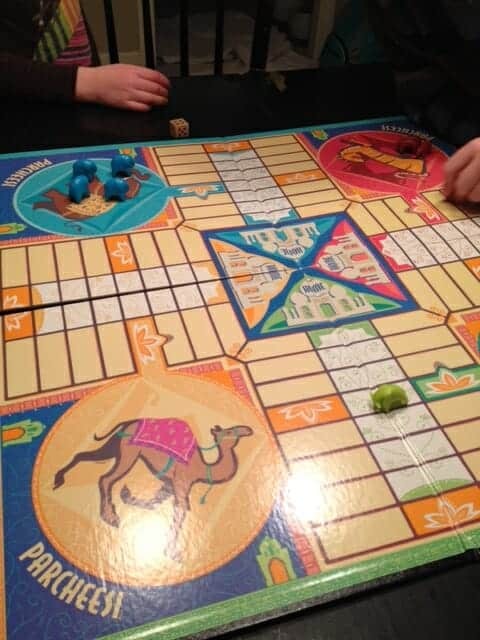 Parcheesi (1-4 players, recommended for age 6 and up). Parcheesi always gives me a flashback to younger and warmer days when I used to spend a week with my friend’s family up in Maine. This game is a timeless classic. My kids love choosing animals and sending each other back to start! Folks, this game is HYSTERICAL. It’s like Apples to Apples (which I adore- both the adult and Jr versions are huge hits over here), but with photos. Every player has eight picture cards and the “judge” for the round draws a “caption” card. The players must each choose the best photo card to go with that caption and the judge decides on the winner. You are guaranteed to laugh. This game would be oodles of fun at a party. I love this game! We received it for Christmas, but this is the first time I’ve had a chance to sit down and enjoy it. 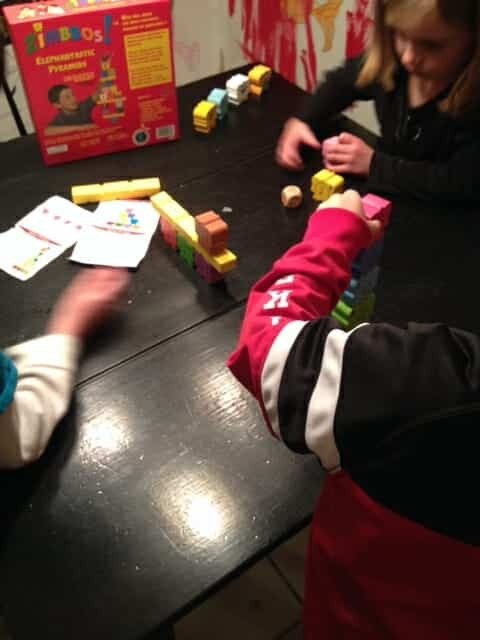 School psych friends out there, this game is like Block Design but more fun. Leo and I had a blast playing it together this afternoon while we were waiting for the rest of the family to be ready to play Rivers Roads and Rails with us. This game gets increasingly difficult, but the way we play is to take turns trying to recreate a card with our blocks. You can also race to see who can complete a card first, and you can attempt to recreate cards from memory. Leo received this game for his birthday from a dear friend. I love this game because my three kids can play it together. They usually sprawl out on the floor so that they have great space to work with. For this game, you take turns adding to a rivers, roads and rails network. Children take turns placing cards to build the network, some cards have all three modes of transportation while other cards might have only one or two, so you must pay attention and match appropriately. The game is fun because each network that you make is different. Plus, who doesn’t love cars, trains, and boats?? We love Professor Noggin cards! We have a bunch of them but last night we played the Human Body set while we were eating dinner. I highly recommend these sets. They come in a variety of subjects and you cannot help learning something interesting. For example, last night we learned that humans and giraffes have the same number of neck vertabrae. Who knew? Professor Noggin trivia cards also spark great conversation, which is why I often choose to pull them out at lunch or dinner. Yes, they were all in jams at dinner last night. We had been decorating library tote bags and there was a paint incident requiring all parties to shower just before dinner. Today we had a geography theme, folks! The Scrambled States of America Game (2-4 players, recommended for ages 8 and up) This game is based on a book, so of course we love it. In a nutshell, there is this brilliantly wacky story about all the states getting mixed up. There’s way more to it than that, but dinner is almost ready and the natives are restless. Let me just say that the book makes for a very fun read aloud. The game is just as goofy but the best part is that the kids learn geography while being silly. At the beginning of the game, the story is told and then each player is provided with a map of the United States and then some state cards (each card has some fun facts about the state). Then a card from the main deck is flipped and it might say something like, “A state that borders Massachusetts” or “Does not touch an ocean” or “Has a 7-letter capital” and the first person to find a matching card in their hand wins that round. 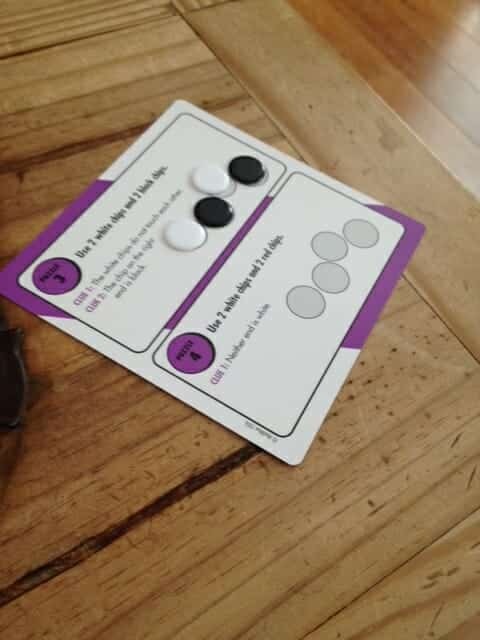 A tiny version of the book is included in the game but I’d highly recommend the actual book as part of your homeschool or read aloud- it’s so fun! 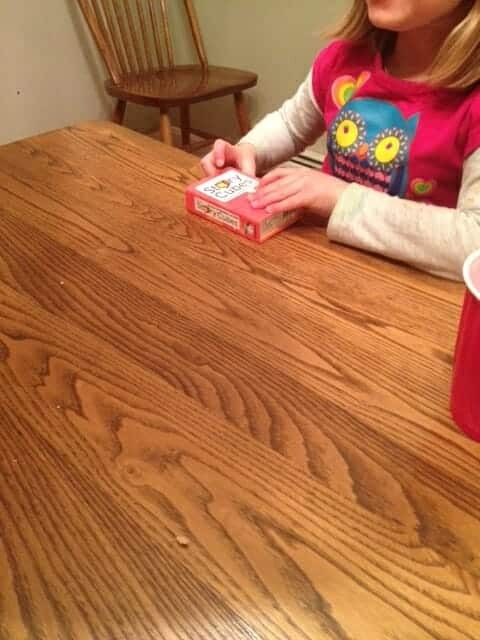 BrainBox for Kids: The World Card Game (1 or more players, recommended for ages 8 and up) Similar to the Professor Noggin trivia cards, Table Topics, and Beginner Dinner Games, we usually play this game at dinner. This is a world-themed memory game. Basically, players are asked to study a given card. The cards cover various topics, such as countries of the world, cultures, oceans, etc. Each card contains fun facts and various details. Then, the card is taken away and the players are asked questions about the card. Obviously, the cards are small so you aren’t getting especially comprehensive information about each country, etc., but it is a fun way to sneak in some geography at dinner. Blokus (2-4 players, recommended for ages 7 and up) We received Blokus from Santa Claus last month and we have played it oodles of times since receiving it. 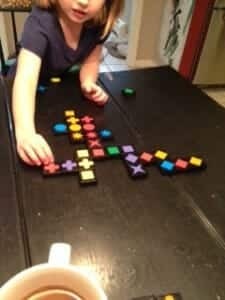 Blokus is a family game that is insanely easy to teach yet challenging enough for adults to enjoy. Each player has 21 differently shaped game pieces and really the only rule is that your next move must touch the corner of one of your previous placed pieces. That’s it, folks. You can explain it in a minute, and yet the game has lots of strategy involved. It is one of those games that all ages enjoy playing. Highly recommend! Cranium Hullabaloo (any number of players, recommended for ages 4 and up) Do you know what always feels weird to me, folks? 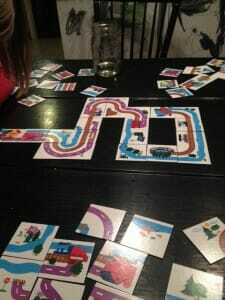 I used to play Cranium Hullabaloo with the kids I babysat for! We had so much fun playing it in their basement playroom, and now I have three kids of my own and I play with them. So, every time we play Hullabaloo I am overwhelmed with great memories of those three little girls who are now amazing young woman. Man, I’m getting old! Hullabaloo is a fun and goofy game that little kids adore. If you have never played, you place rubber mats all over a room and then you press the start button and you have to listen to the narrator tell you what to do. It’s like a twist on Simon Says. If the narrator tells you to go to a purple pad, you do so. If he asks you to find an instrument, you find one. Eventually, just like in musical chairs, the round stops and the narrator will say if you are on ______ you win. Best part? Often the winner gets to do a funky dance. Who doesn’t love that?? Today was filled with science experiments, followed by Destination Imagination in the afternoon during which we had some major library drama. As a result, my little poppies spent what would normally be our game time writing apology notes and then delivering them to our beloved librarians. As a result, the only game we could play was Beginner Dinner Games, with a little Table Topics thrown in during dinner. Not our best #boardgamechallenge day, folks! Candyland (2-4 players, recommended for ages 3-6 years) Today we played Candyland. I used to love this game as a kid but it’s not my favorite as a grown-up. That said, it makes my kids so happy that I play it. 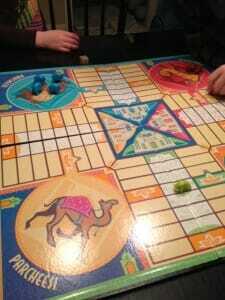 I do, however, really miss the old game board. The characters from the 70s and 80s were way cooler! Leo loves this game! I just checked and it is not available on Amazon so I’ll park a link to the Simply Fun website right here. 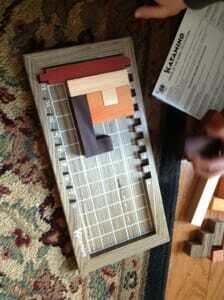 The game is made of solid wood, which is nice, and has fun colors. Basically, the game is an introduction to levels and balance. There is a four-way moving seesaw and players take turns balancing blocks on the seesaw, being careful not to spill the blocks. The goal is to rid yourself of blocks. The game is easy to learn but offers a fun challenge. Today’s games are brought to you by my generous friend, Trish, who always showers us with hand-me-down books and games. She dropped a huge box full of goodies this afternoon, just in time for a blizzard. 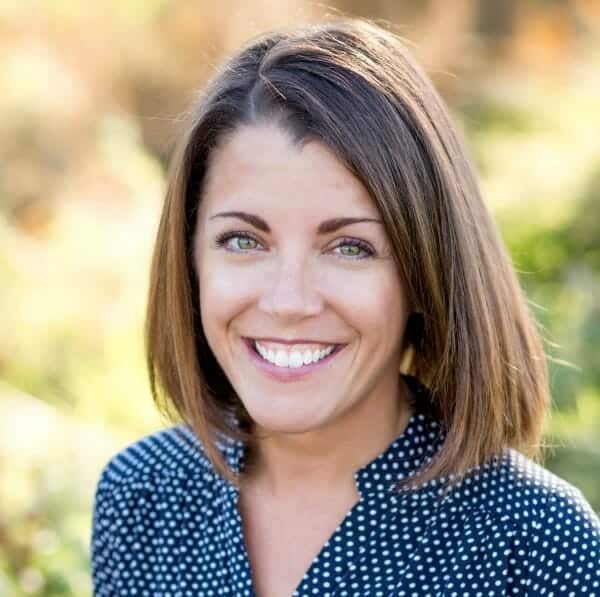 Thank you again, Trish! eeBoo Tea Party Game (2-4 players, recommended for ages 5 and up) This game is adorable and perfect for my two littlest poppies who love to play anything involving imagination. We already have (and love!) eeBoo’s Fairytale Spinner Game, and so T and Seuss knew exactly what to do with this game. To play the game, you spread out the sweet little picnic blanket and put the teapot spinner in the center. Everyone takes a seat and you spin to “win” tea party items (teacup, cream and sugar, utensils, plate, sandwich, fruit, dessert) and the first player to accumulate all of the items is the winner. The thing I love about eeBoo’s products (because we have several, including our beloved Tell Me A Story Cards and their memory game, among others) is that the illustrations are always beautiful and their products inspire imagination and play. 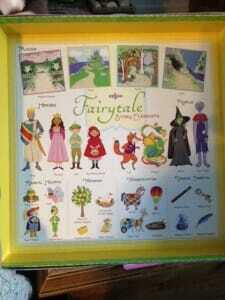 Just as when we play Fairytale Spinner and Tell Me a Story, the Tea Party Game took on a life of its own. It was as if we were sitting down to tea (in fact, we did brew a pot when we were done!) and having a little picnic together. Linda even joined us! My Busy Books I’m not sure My Busy Books is technically a game, but my kids have been having so much fun with them that I thought I would list them here. My Little Poppies received the Frozen Busy Book from Nana and Papa at Christmas and it has been played with almost daily since then. 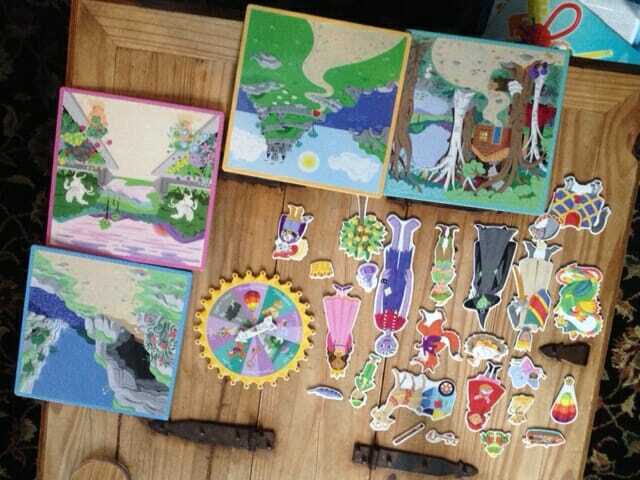 And then this afternoon, we received the My Little Pony and Strawberry Shortcake Busy Books from Trish. They are huge hits over here with T and Seuss who love any and all imaginative games.I’ll be honest with you and state that these books will not win any literary awards. 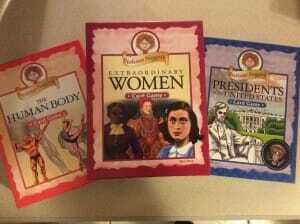 In fact, the story for each book is on the lame side. 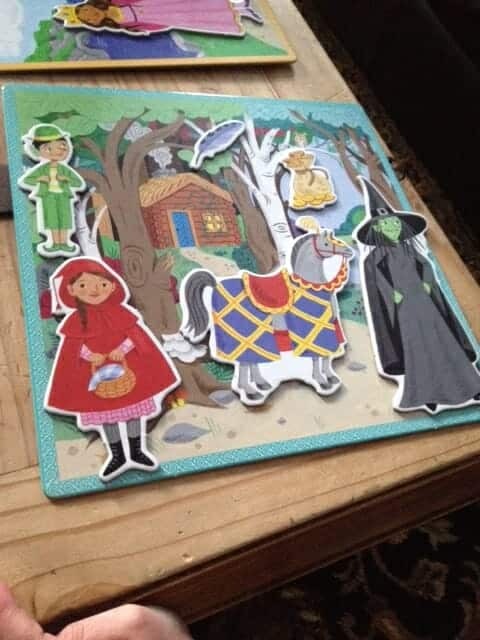 That said, it comes with a play mat and teeny-tiny figures (they are small, so I wouldn’t recommend them for a house that has babies) and so you can make the story come alive when you are done reading. The book is like a little box so there is storage for the mat and people in the back. Uno (2-10 players, recommended for ages 7 and up) This is a classic, easy-to-learn card game that is fun for the entire family. It always reminds me of playing at the beach when I was a kid. I thought we’d play oodles of games today, since we are in the blizzard’s path, but we actually only played one so far. I’m sure we’ll play more tomorrow after the newness of all that white stuff wears off! I’ve mentioned before that I’m a school psychologist and, as a result, I have lots of board games, puppets, dolls, etc. that are holdovers from my working days. This game is a fantastic way to practice social skills, turn taking, and to inspire conversation. It also comes in a school version and a home version. I have dreams of getting the home version at some point but Schizz always says we have enough games. Oh, Schizz! Anyway, I would highly recommend this game. It never fails to make for great conversation! Boggle Deluxe (any number of players, recommended ages 8 and up) Boggle is a great game to play any time, but you can also play during a meal as we did tonight during dinner. We gave each person a sheet of paper and a pencil and they wrote down as many words as they could find. For the younger kids, they wrote “words” or just letters that they found. Boggle is a great game for traveling, as it packs up easy. We have the deluxe version, so the playing board is larger, but there is also a modification included to make the game a normal size. Boggle Yes, again. Apparently this was a hit yesterday because when I came downstairs this morning there was a Boggle festival happening at the breakfast table! 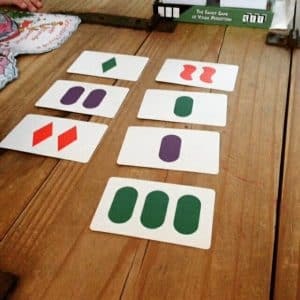 Tell Me A Story (any number of players, recommended for ages 3 and up) This card game can be used in so many different ways. It is made by eeBoo, a favorite company of ours. The illustrations are beautiful. Each deck has a theme and you use the cards to make stories. When we received our first deck, several years ago, I would use the cards to create stories for the kids so that they got used to it. Nowadays, we take turns. You can tell your own story and then have a friend tell theirs, or you could take turns telling the same story based on the cards. You can arrange the cards in the order you’d like, or pick randomly and fill in goofy details. If you’re really crazy, you can mix multiple decks together. 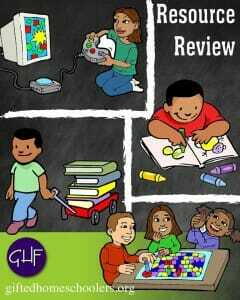 This is such a great early literacy game that fosters creativity and imagination. Both of the games that we play today travel really well. We’ve taken them on vacation and to restaurants. 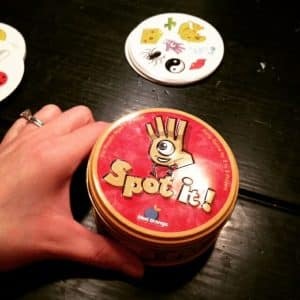 Spot It (2-8 players, recommended for ages 7 and up) I played this game at a toy store once with the store’s owner, who had just received it that day. The neat thing about this deck of cards is that any two cards has one, and only one, match. Each card has colorful objects and words on it, in various sizes. In this game, you have to be the first to spot it. Everyone is playing at once so it’s fun and fast and crazy. The winner is the person with the most cards at the end. My boys, especially, love this game. 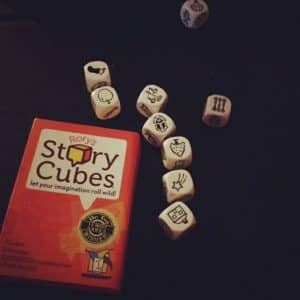 Rory’s Story Cubes (1 or more players, recommended for ages 7 and up) If you like Tell Me A Story Cards (and, clearly, we do! ), you will love Rory’s Story Cubes. They can be used as an ice breaker in a group activity, as a one player game, or in a group. There are several versions if you want to play with a group, but the way we normally play is to roll all nine dice and then tell a story based on the images rolled. Rory’s Story Cubes never fails to elicit laughter, all the while building creativity and imagination. Apples to Apples Junior (4-10 players, recommended for ages 9 and up) I am a big huge fan of Apples to Apples and was overjoyed when I realized there was a junior version. Just like the big kid version, the junior Apples to Apples is hilarious. In case you’ve never played, each player receives eight red apple cards. For each round, one player is the judge. The judge draws a green apple card and reads it aloud. Each player finds the best card in his or her hand to pair with the green apple card. The judge picks a favorite and the winner had the most green apples at the end. It is hilarious, folks. Globe Okay, I realize this isn’t a game but my kids have so much fun with it. We will often eat lunch with our globe on the table. We take turns spinning it and landing our finger on some random spot and then I read about the location on my iPhone. We also usually have our globe out on the table on the nights we play Brain Box for Kids. 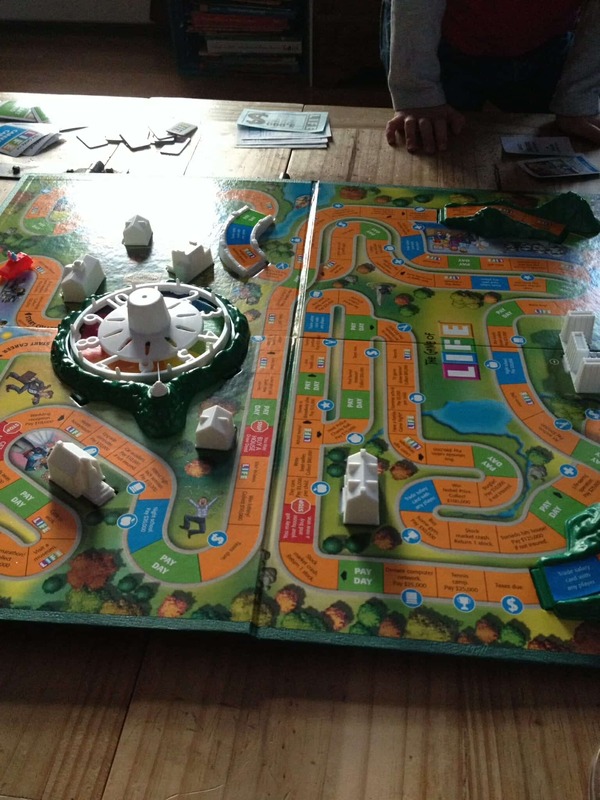 Game of Life (2-4 players, recommended for ages 8 and up) Folks, this game is a classic! Doesn’t it remind you of the 80s? Let me tell you, my kids don’t know what half of the stuff in this game even means but they always ask to play it. They love the little cars with the peg people and we have the best conversations about life skills, careers, home ownership, and money management. Mad Libs I know, I know… this isn’t technically a game, however, it is tons of fun. Mad Libs teach parts of speech in a covert and highly comical way. Math Dice (1 or more players, recommended for 8 years and up). This is another one of our favorite math games, like Sumoku and Countdown. I love this game because you can modify it for younger players. So for Seuss (3 years), we roll the dice and let him count the dots to get the total. 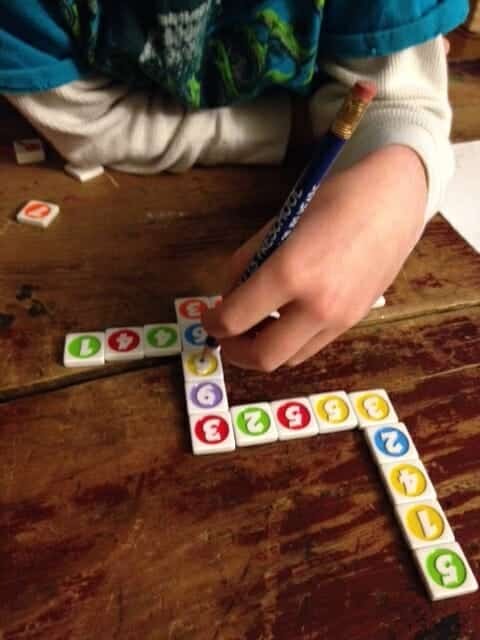 For T (5 years), we roll several dice and have her add the numbers together. For Leo, we roll the target dice and then he attempts to reach a target number with the other dice. 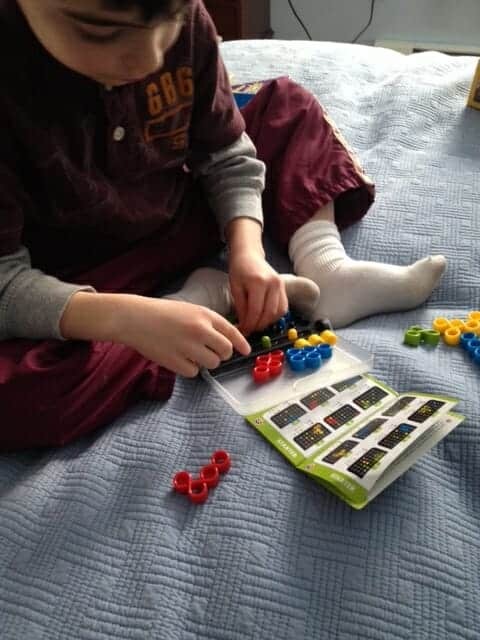 Math dice are easy to travel with and they are a great way to practice mental math. Leo loves to play chess. A while ago, I purchased this straightforward chess set. I wanted something simple and I liked that this one folds up to store. Discover Toys Wiz Kidz Card Game I have an incredibly old version of this game from when I was a little girl. The cards are actually yellowed. This is such a simple game but great for little kids. One deck has a question (something in this room, a country, a well-known person, a color) and the other deck has letters. Players take turns flipping a card from each deck and then they try to come up with an answer to the question card that begins with that letter. It’s a great game even for those who aren’t reading yet because it practices letter sounds, too. Indoor Hopscotch (any number of players, any age) We can’t play in our yard during the day due to construction so we played indoor hopscotch while Seuss was napping this afternoon. If you are stuck indoors and want to wear those kids out, click here for some great tips! Tell Me A Story Cards Yes, again. Today we played the Circus Animals’ Adventures and the Fairytale Mix-Ups versions. eeboo Friendly Animals Matching Game A friendly lately gave us some hand-me-down games and this game was in the box. I cannot find a link to it and I’m assuming it’s the older version of this eeboo memory game which we received for Christmas and love. This company makes the most beautiful illustrations. Anyway, we wanted to play it once before passing it on to someone who doesn’t have a memory game. Any local takers? 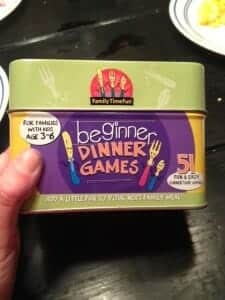 Beginner Dinner Games Yes, again! Beginner Dinner Games Yes, again! OBSESSED. SET is a fantastic card game that has won over twenty-five best game awards. I know so many people who adore playing this game as a family. 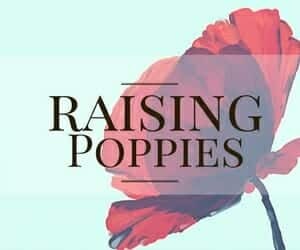 I’ve tried it a few times and it’s tricky for my littlest two poppies. I see a lot of promise for this game in our future, but we aren’t in a place to be able to play this (well) as a family of five just yet. Can’t wait until we can, though! When SET resulted in frustration for the little two, we decided to switch things up and try a different game. 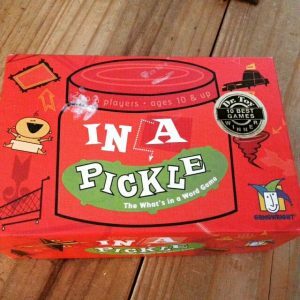 In A Pickle (2-6 players, recommended for ages 10 and up) In this goofy card game, you need to think outside of the proverbial box. Each card contains a noun. Four cards are placed on table and then players take turns fitting one of their nouns into a noun on the table. And this game was especially exciting because Seuss read these words all by himself! So you might have a card that says monkey and one that says phone booth and you could put a monkey in a phone booth, so you could play that card. It gets pretty hilarious trying to fit the cards in your hand into the ones on the table and the explanations are priceless. After a few rounds, Schizz and I found ourselves playing this game by ourselves. Our little poppies had decided to practice their ninja maneuvers instead of playing with us! Trouble (2-4 players, recommended for ages 5 and up). Is there a kid out there who doesn’t love Trouble? Did you just hear that die bubble pop when you read these words? 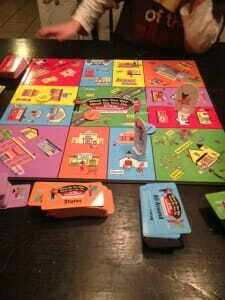 My little poppies and I played a very exciting game of Trouble today. My Trouble is ancient, folks. This is the same board I played on when I was a kid, and that makes it all the more special! Mirror Mansion (2-4 players, recommended for ages 8 and up). The boys played this game together. I have actually never played it, T and I were busy folding laundry when they were playing so I can’t give a thorough review. 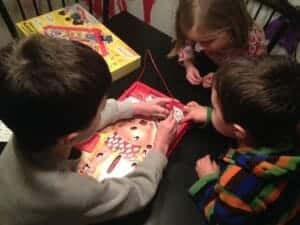 Snap Circuits Folks, this is not a game but Snap Circuits are such an amazing activity that I had to list it here. Leo received his first kit when he was five. 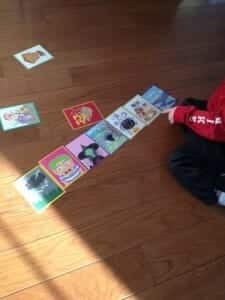 He was reading at the time and could do the activities independently. 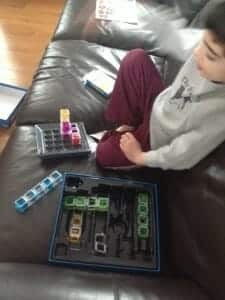 This kit keeps him busy and [mostly] quiet for hours. Because of that, I needed to mention it in here. We’ve used Snap Circuits quite a bit this winter and we used them a ton today! Hide and Seek (2 or more players, all ages) Yes, we totally did. This insane winter of ours has caused a resurgence of Hide and Seek around here! Gravity Maze I believe it’s fairly clear at this point that we have a game obsession over here. We have many favorites, but we adore Gravity Maze. It is a one player logic game and it is tons of fun for both the little kids and the big kids- Schizz and I can’t help but play when it is out! 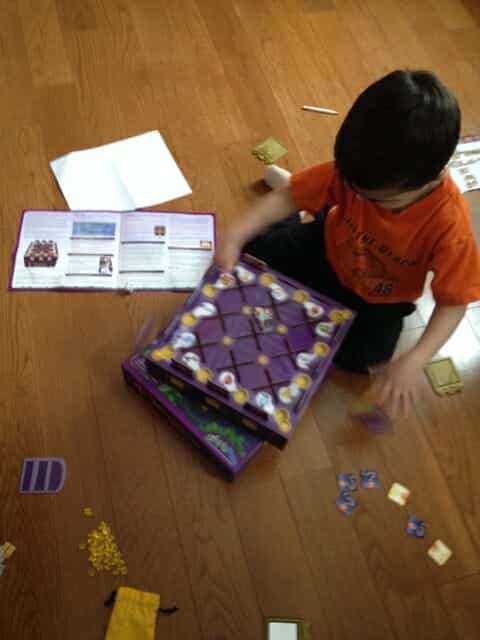 If you want read more about Gravity Maze and other one-player games that kids adore, please click here to read an earlier post. The Sneaky, Snacky Squirrel Game (2-4 players, recommended for ages 3 and up). 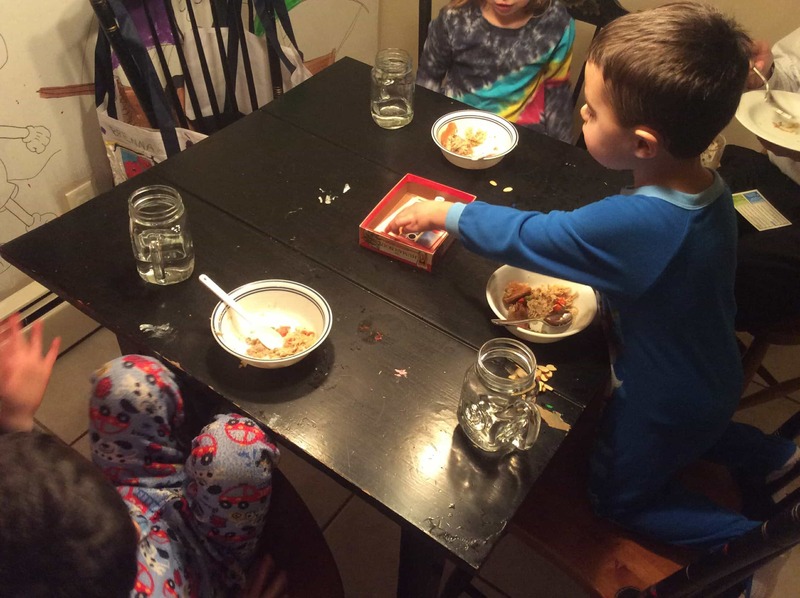 Leo wrote an adorable post about this game over the holidays. 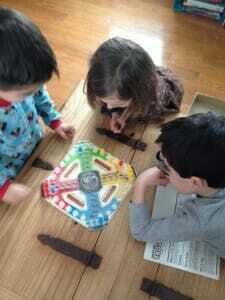 My trio adores playing this fun and colorful game! Battleship (2 players, recommended for ages 7 and up) I have so many board games that I saved from when I was little and this is one of them. It’s beat up and yellowed but it works just fine! I have to admit, Battleship was never my thing. 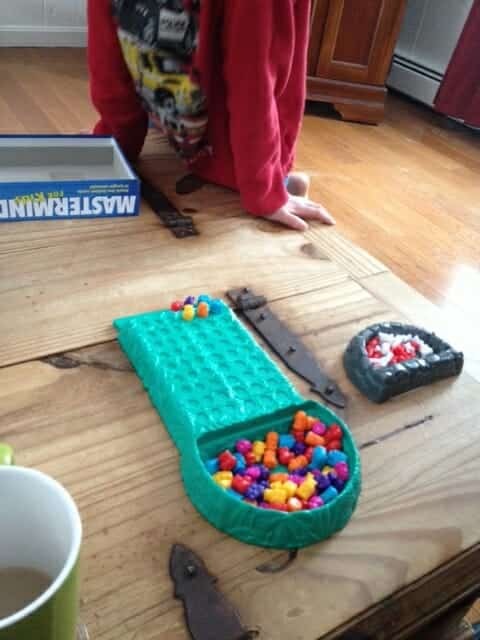 I have two younger brothers [who never liked playing games as much as I do] and Battleship was a gateway game. I always hoped that if I could get one of them to play Battleship, they might be willing to play something else. Later, I used my childhood Battleship in Boston, when interning at an alternative school. It sounds stereotypical but I find that boys love Battleship. Leo is no different. He loved playing today. Mazeball (1 player) This is a fantastic one-player game. Warning: addicting. Imaginets (1 player) I do not believe this is technically a game, however, it is worth sharing. I’ve had this game since Leo was young and it is such a worthwhile investment. The entire thing folds up to store easily. 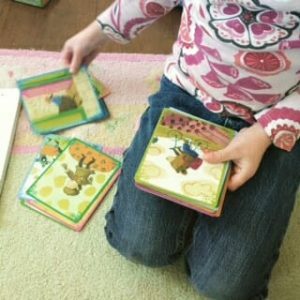 There are magnetic shapes and pattern cards and your goal is to recreate the patterns/images using the magnets. The cards get increasingly difficult. I love this activity, folks! Wobbledeck (1 player) I’ve written about this one before. The kids have been playing Wobbledeck more lately. I believe it is because our home is under construction plus we’ve had freezing temps today. They need exercise but it’s hard to get. Speaking of which, if you’re looking to wear your kids out in bad weather, click here. Happy Valentine’s Day, folks! We hope your day has been a good one. We had lots of family time including several games and a wintry hike. The calm before tonight’s storm! If you are looking for games to keep you busy this winter, today’s choices are great ones. We had a logic theme going on today for sure! Logic Links This is a fantastic logic game. The box is small and portable and the cards start out quite easy but grow more challenging over time. The goal is to follow the clues to arrange the links in the correct order. It gets tricky very quickly and is a fun challenge. Rush Hour This might be my favorite game at the moment. I just love how portable it is, and it is quite challenging. I love a good logic game and Rush Hour fits the bill! 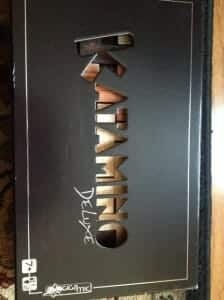 Katamino Yes, again. This game is so much fun, folks, and it’s gorgeous. Leo loves to use it during his quiet time. Mastermind for Kids (2-4 players, recommended for ages 6 and up) This is the classic Mastermind but geared toward young children. Using colorful animals and a jungle theme, you must use logic to break the code. There are several levels of play so you don’t outgrown this game too quickly! Rory’s Story Cubes (1 or more players, recommended for ages 7 and up) Yes, again!! As I’ve mentioned previously, if you like Tell Me A Story Cards, you will enjoy Rory’s Story Cubes. We often play this game during dinner, as we did this evening. Academy of Fun Trivia Game (any number of players, any age) You can’t find this game on Amazon, folks! We have been making it ourselves. Tell me, do you ever make games with your kiddos? Logic Links Yes, again. Sometimes we get obsessed with a certain game, folks! 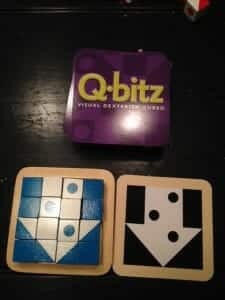 IQ Twist (1 player, recommended for ages 6 and up) This is another fantastic one player logic game. It also comes in a travel case so you could easily take it in the car, to a restaurant, a doctor’s appointment, or on vacation. Sneaky Snacky Squirrel Yes, again. Schizz got home early from work tonight (Allelujah!) and the kids taught him how to play this one. Sorry Yes, again. My kids love this game, folks! Folks it is so cold outside today. Do you know what I did today? I took my own advice, and we did every single one of the items listed in my How to Wear Your Kids Out in Bad Weather post. Pathwords is a fantastic game by Think Fun. This is a word search game. Each puzzle tells you which tiles to use and you have to place the tiles in such a way so that each tile covers a word. The puzzles start off easy and get increasingly difficult. Our Pathwords came in a cool little travel case so you can play it in the car or at a restaurant. Word A Round is a fast and fun word searching game that can be played a couple different ways. 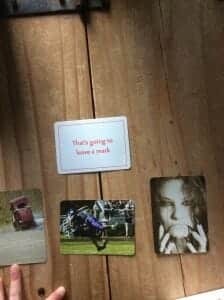 The goal is to find a hidden word on each card. There are three rings per card and there is a hidden word in each ring. We will often play this game as a one–player game, too. Fluxx Okay, folks. Everyone loves this game. I received it in my stocking and broke it out this evening. 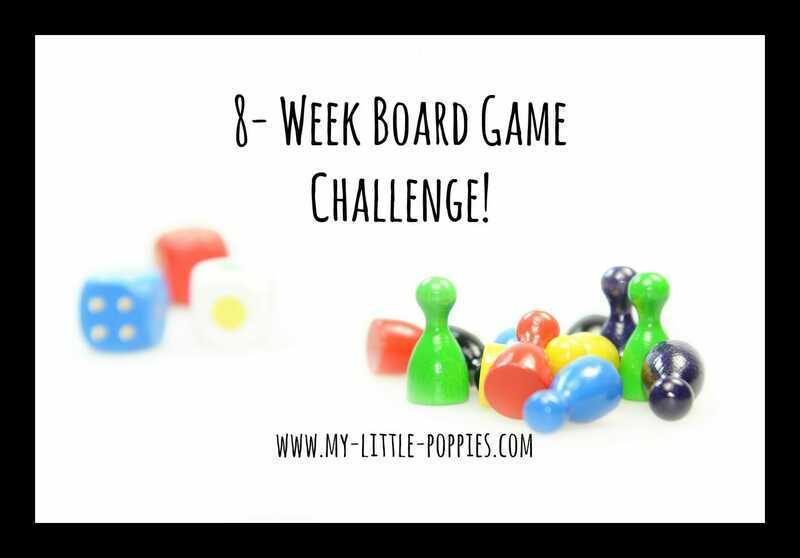 I’m majorly, totally, completely sleep-deprived and I wasn’t caffeinated enough to comprehend the instructions (don’t judge- it’s been a week), but I felt it was important to include this game here because our Board Game Challenge is almost finished and, as I said, everyone loves it. I have friends who have been telling me to get this game for years so I have no doubt I will adore it when the dust settles (literally) and there is less noise in this construction zone! Eeboo Paper Dolls Not exactly a board game but T and Seuss adore these paper dolls. Do you remember colorforms from when we were little? I had a Smurfs colorforms set and they were amazing. I was obsessed with them when I was little and this reminds me of those days, folks! Sylvan Second Grade Math Flash Cards Folks, I’m not a flash card person. I was never a flash card person. 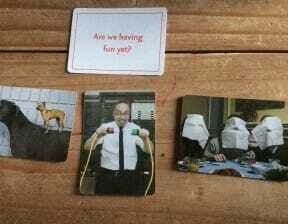 We won these cards in a raffle. They were part of a “math game basket” that we entered to win and… we won! 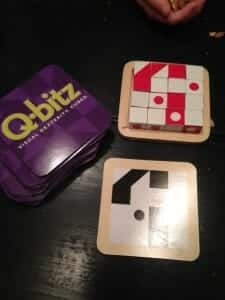 The games contained in the basket: Quirkle, Math Dice, The Adventures of Penrose the Mathematical Cat, Rummikub, Math War, Blink, and Prime, are all amazing games. It was a great win, folks! 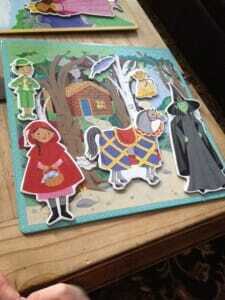 That said, I have a kid who apparently likes flashcards and so we played these tonight! Cartoon It! is a perfect game for our art-lovin’ family. The illustrator of this game is actually a cartoonist. In this game, you attempt to memorize your card, which depicts a cartoon character. Each character has six specific features and you attempt to get as close to the original image as possible, within 30 seconds. In our family, we don’t time. Folks, this game is HILARIOUS. It’s one of those games during which the parents have just as much fun as the kids. Snowtime Anytime Indoor Snowball Fight is a goofy gag gift that we received as part of a Yankee Swap. When it’s too cold to go outside (or if you don’t have snow! ), Snowtime is a great way to kill some time with the kids. It never fails to cause major giggles, and sometimes an injury or two, but the kids absolutely adore this silly game. Jenga Remember this game, folks? I had it in college, back in its prime. It is entirely possible that we used Jenga as a drinking game back then, but I’ll keep this G-rated. My kids recently unearthed Jenga. They ADORE Jenga, folks. Sushi Go I received this game from a dear friend because I’m a bit sushi-obsessed. Apparently, this game was a Kickstarter. It gets amazing reviews on Amazon. I absolutely adore the illustrations and, I’m not gonna lie, they gave me a hankering. The object of the game is to try to get as many sushi points as possible. It’s easy to play because the points are written on each card. You are dealt a hand, choose a card, and then pass to another, choose a card, pass, etc. The person with the most points at the end wins. I love this game but my kids weren’t nearly as excited as I was so I’m looking forward to playing it with some adults who are more appreciative of the cute sushi illustrations and scoring. This would be a great stocking stuffer for the sushi-obsessed person in your life. Because the Board Game Challenge is ending, I’m going to be honest and tell you that we just got these two games and haven’t played it yet. However, I do not know a soul who owns them and doesn’t love them. I’m extremely excited about playing these games with my little poppies. It’s been tough to set up games this week because of the construction but I’m seriously considering fleeing the premises and taking these with us! I love Quirkle!! Will have to check out Zingo – I had never heard of it before reading this! We’re not great at playing board games…my oldest gets upset when he loses. He doesn’t cry or tantrum about it any more (and believe me, he used to – this, from a relatively even keeled child), he just chooses not to play because he knows he doesn’t like to lose. :-/ Definitely something we should work on this winter. Thanks for the reminder! Our oldest doesn’t like to lose either but he’s so much better than he used to be. 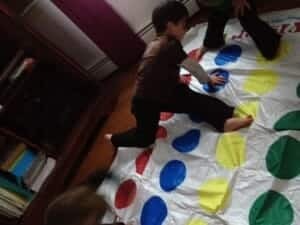 Growing up, we rarely played games because my brothers would get so mad while playing!